Two of the leading causes of death in the world today are heart attack and stroke, so the use of arterial ultrasound to reduce the risk of both is one of the most important aspects of modern medicine. UsedUltrasound.com carries a complete inventory of arterial ultrasound machines with prices that are up to 60% or more off the cost of a new machine. Through the use of arterial ultrasound, often combined with Doppler ultrasound, doctors are able to examine the speed and flow of blood through the arteries. Any abnormalities can be a sign of trouble, and oftentimes arterial ultrasound is a life-saving procedure because it allows the doctor and the patient to detect potential problems early on and then take measures to reduce the risk of future problems. 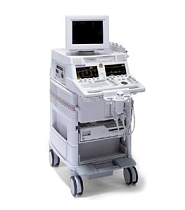 Some of the most popular machines for arterial ultrasound are the HP Sonos 5500, Philips iU22 and SIUI CTS 200. There are so many choices when it comes to buying a used ultrasound machine that the selection can sometimes be overwhelming, but you can easily compare the best features and prices on a wide selection of pre-owned ultrasound machines at UsedUltrasound.com. We make it easy to find the best model for your needs at the best price. And once you find the right model, you can be confident that it will perform just like a new one because all of our ultrasound machines go through an extensive 15-point reconditioning process that includes a complete test and inspection to make sure it meets the original manufacturer’s specifications. It’s just like buying a new machine, but without the new machine price tag. When you are purchasing a pre-owned ultrasound system, that’s the perfect time to also buy pre-owned ultrasound probes, transducers and accessories from UsedUltrasound.com. We offer low prices on used parts for just about every ultrasound system.